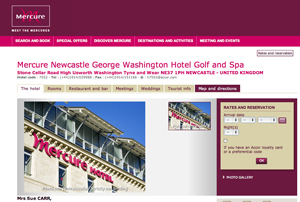 The Mercure Newcastle George Washington Hotel Golf and Spa has completed a £9m refurbishment. Previously the independently-owned George Washington Golf and Country Club Hotel, the property is located on the outskirts of Newcastle Upon Tyne and is now part of Mercure Hotels. The 103-room property offers an 18-hole championship golf course, a new golf clubhouse, conference centre and bar. Events space includes two function rooms with capacity for 180 delegates and seven syndicate rooms for smaller meetings. It also offers the Brasserie and Lincolns Restaurant. Mercure UK director of operations Jonathan Sheard said: "We are delighted that the recently renovated George Washington is joining the Mercure portfolio. The hotel is a good fit for the brand with its great setting, and we're confident it will be a success."